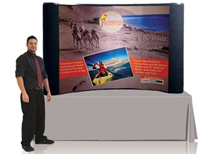 Table top pop up displays are the most portable trade show displays available. The pop up display is only 2/3rd's of the height of a standard pop up display making it lighter, easier to transport, and more affordable. 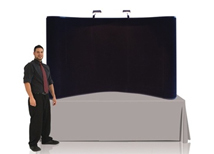 Many convention halls do not allow floor standing units so the table top pop up display is a must. 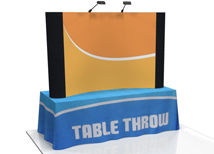 We offer fabric tension pop up displays that assemble in less than one minute due to the seamless fabric graphic that stays attached at all times. We also offer economy and premium pop up displays that have either Velcro receptive fabric panels or mural graphic panels. 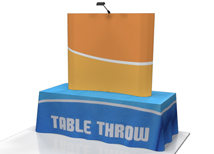 Embrace TABLE TOP 5'w x 5'h SEG Display - Seamless Push Fit Graphics! 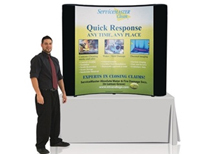 Embrace TABLE TOP 2.5'w x 2.5'h SEG Display - Seamless Push Fit Graphics! 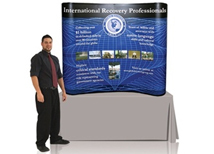 Embrace TABLE TOP 5'w x 2.5'h SEG Display - Seamless Push Fit Graphics! 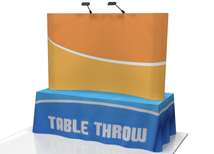 Embrace TABLE TOP 8'w x 5'h SEG Display - Seamless Push Fit Graphics! 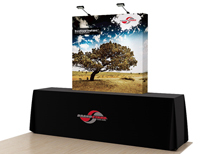 Table top pop up displays are still one of the most popular display options because of their professional look and affordable pricing. 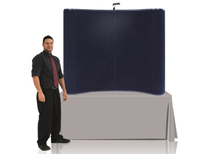 We offer a complete line of all pop up displays so our customers can choose the best option for themselves. Our large format printing options will give you the correct graphic print that you need for any application. Our standard 600 dpi UV print is very clear and durable but we also offer Lambda print which is the clearest large format graphic available. 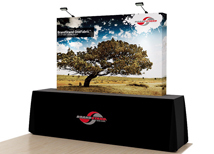 Panel displays are also great options for exhibitors who need a table top pop up display or need a graphic print and a reasonable price. 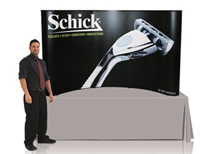 All or our trade show stands are stocked and printed in the US for fast turnaround and great quality control. 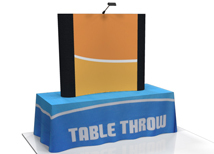 We also offer many other types of table top displays that are great for exhibitors on a tight budget or exhibitors that go to many smaller conventions.